Our new little girl (who has a name that I will share soon!) had her heart looked at VERY closely yesterday by Anniston's wonderful, amazing cardiologist, and it is PERFECT! The doctor actually said the pictures of her heart were textbook worthy :). "Beautiful. 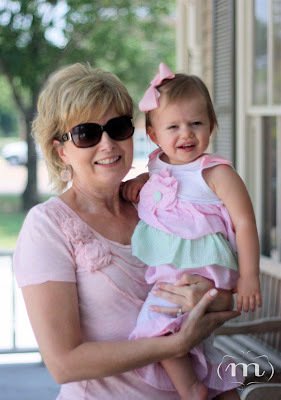 Her aorta doesn't just look good; it looks beautiful," she said. I can remember at every echo/ultrasound with Anniston, they would look so intently for her aortic arch, hoping that maybe they would see a glimpse of it. We would squint our eyes, trying to see that connection. Little did I know how easily it would appear in a heart healthy baby, as it did yesterday. It was big and wide and "beautiful." All the other valves, arteries, vessels, blood flow in the cord, chambers, everything else looked perfect, too. I feel very confident now saying that we have two heart healthy babies :). Just wanted to share :)...we are so very blessed. We had the BEST time! Relaxing by the beach, relaxing by the pool, painting pottery, riding bikes everywhere, enjoying the farmer's market, pretty much inhaling the food, soaking up time with family, eating key lime pie on a stick while watching those in better shape than us attempt to surf in the rough, beautiful water...that about sums up what we did! It was great! These days, Anniston's neurology appointments are pretty uneventful (which I am VERY grateful for)...no seizures to talk about, and she is doing well, so I was really feeling pretty indifferent about the appointment. The only thing that I was slightly dreading was telling them how far she still (I feel) has to go motor and speech-wise. We did pray, as we always do before these appointments, that we would be encouraged even though it really was just a simple check-up. Well, we were encouraged :). Her doctors were literally shaking their heads in disbelief that she could be doing so well after the stroke she had. They said it would be devastating for an adult to have her stroke, and I know they said these things at her last appointment, but I guess it has taken some time to sink in. When she had her stroke at four months old, we were in such a state of shock and just did not realize the extent of the trauma even though we had seen the pictures of her brain. It's hard to talk about, but basically half of it was gone. Let me tell you, God is restoring her. She is learning and growing so well. I cannot tell you the comprehension that this little girl has. She knows everything going on around her, and I feel like I could teach her just about ANYTHING at this point even though she is not exactly talking much. Anniston has this "grin" (eyes closed, toothy/cheesy grin) that she does that we always laugh at, and you can tell that she knows she is cute :). She even will do it when we tell her to "grin". Well, the other day, I was telling her not to do something that she knows she should not do (tossing items from my bathroom drawer into the shower), and she just looked at me and gave me that "grin". It was all I could do not to laugh. She is already trying to use her cuteness to get out of trouble, so I am pretty sure she is doing just fine :). Yesterday at the appointment, the Resident who saw her at this visit and at our last one in December said that he could tell a MAJOR improvement since then...if I didn't know that he has an incredible memory, I might wonder if he was just saying that, but he seriously remembers crazy details about his patients. He and the main neurologist were so very encouraging. They said we were doing a great job with her, which may sound like a silly thing to take comfort from, but it really does mean alot. I always feel like I could do more for her, no matter how much we may do. I haven't mentioned this, but Anniston has had some trouble walking again. The muscles in her right leg have been tight from a growth spurt, and she has been afraid of falling again. The doctor said her leg did not feel too bad but did mention botox shots if we were interested when she is older (to loosen the muscle). We have heard different reviews on them, but apparently it is pretty common with neuromuscular issues. Not a big deal, I guess. We are very convicted, though, to have faith and to keep believing for her restoration. I was reading I Corinthians 12 the night before this appointment, and God just reminded me of His power and of how He intended the body of believers to live. It would be selfish for us to think that we could do any of this without Him or that it was our "work" that did anything...it is only Him. I just pray that we would look to Christ and trust in Him...that Anniston's life would bring Him glory. My thoughts/concerns about her speech were put at ease as well. They once again encouraged me with the fact that her comprehension is wonderful. The left side of her brain (where speech is) was affected by the stroke, but the fact that pathways for language are obviously being made, they said was a very good sign that the rest would come...it just could be a little more difficult. That's fine. We serve a big God, and this is itty bitty for Him...and itty bitty compared to what some are going through. Thanks for listening to my long spill if you are still reading :). We are so excited and feel so very blessed and thankful. The most important part of our sonogram was that our sweet girl looks very healthy, and her heart looks great. We go to the cardiologist for a more in-depth look the end of the month but are very hopeful, believing that all looks good. She was so sweet during her show...sucking her thumb like Anniston did during the same sonogram, doing flips, and touching her fingers to her cheeks. Speaking of cheeks, they looked full like her big sis's, and she seems to have those same sweet pretty lips. Thank you for your wonderful love and prayers! We have some healthy little girls. Happy Happy Birthday, sweet girl!! So crazy that you could be two...we are all beyond thankful for you and your miracle life more than you could possibly know. 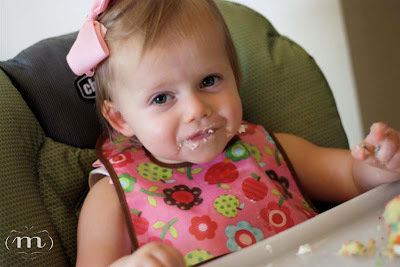 You are doing so many fun things and are growing and learning like crazy...more on that soon! Love you, little girl!!! 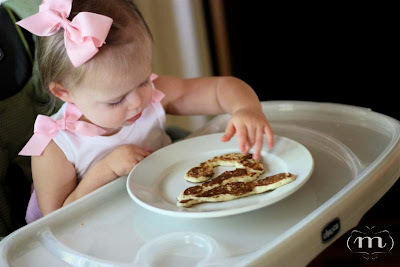 Started with pancakes and eventually peaches...sad that I forgot to put them on her special birthday plate :(...but she didn't mind at all :). I will say I couldn't believe the "two" came out looking anything like a "two". 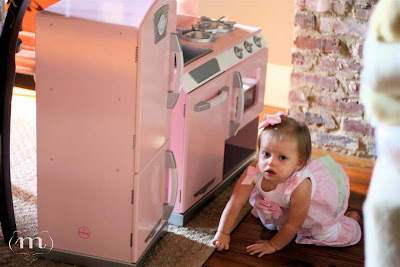 After breakfast, Anniston saw her brand new pink kitchen from Stan's parents and grandparents. How cute is it?! Perfect for her big girl room soon. She loved it!! 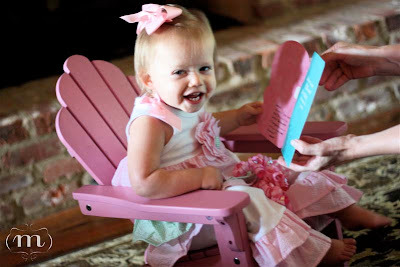 Then she sat in her new pink adirondack chair from my parents. So adorable!! Will go on our back porch by the grown-up chairs! After OT, we went to lunch. "Cheese." In her new, spiffy sunglasses...she seriously LOVES them. We picked up a cupcake after lunch. A hit as well. After nap and some play time, we went to a nearby playground...she was sad to go to sleep :(. Sorry for the short sentences. My mind is struggling at the moment. All in all, it was a FUN day, and I will add playground pictures to this post later if my super-slow computer will cooperate! Again, Happy Birthday Anniston!!! So thankful for the last two years! On another note: we go to the doctor tomorrow to find out what we are having!!! Any guesses? We have no idea! Will let you know asap.